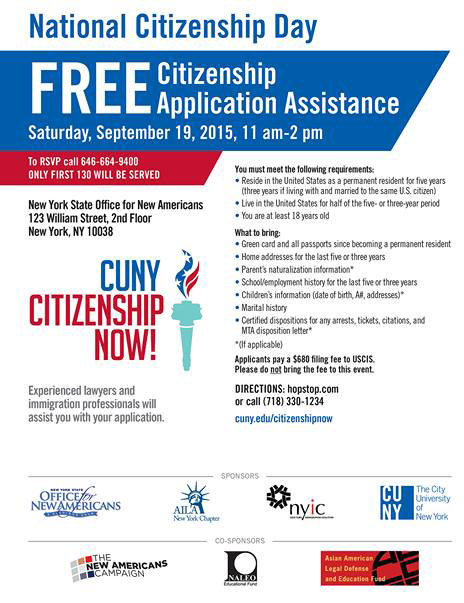 In celebration of National Citizenship Day 2015, AALDEF is partnering with CUNY Citizenship Now! for a free event to assist lawful permanent residents interested in obtaining citizenship. Co-sponsors include the New York State Office for New Americans, American Immigration Lawyers Association – NY, New York Immigration Coalition, CUNY (The City University of New York), The New Americans Campaign, and National Association of Latino Elected and Appointed Officials.